Brief Synopsis: Booster foils a terrorist bombing at a Metropolis ice hockey game, earning the respect of the Metropolis police, before again retreating into his private world of loneliness. Issue Summary: Mister Twister is holding the entire Metropolis hockey arena hostage with a giant bomb. Booster Gold offers his assistance, but police Lieutenant Rogers refuses the aid of a "gloryseeker." Despite this disapproval, Booster intervenes anyway and is caught by Twister. When the media gets wind that Booster Gold is involved, Dirk Davis and Trixie Collins become glued to the news broadcast. Together they watch reports as Booster battles Mister Twister's goons. In the process of evacuating the bomb from the building, it appears that Booster has been killed in an explosion over the city. Trixie and Dirk are overjoyed when Booster comes through unscathed. Booster returns home to his penthouse apartment where he and Skeets discuss the resolution of his recent tax problems. Before falling asleep, Booster cryptically laments events in his mysterious past. Story Notes: The title of this issue is a reference to the beginning of play in the sport of hockey. A "face off" occurs when the two opposing teams line up and attempt to gain control of the puck to begin play. FIRST APPEARANCE: First appearance of Mister Twister, a poorly-defined villain who only appears in this issue of Booster Gold. FIRST APPEARANCE: First appearance of Lt. Rogers of the Metropolis Police Department. The current month is March, and it is snowing outside of the Metropolis Metroplex, a multi-use stadium currently housing a professional hockey game. The police car in front of Rogers is car number 54, a reference to a black and white television sitcom from the early 1960s. Booster receives a very cold welcome from the police on the scene, policemen who were previously lamenting the absence of Superman. Booster will never gain complete respect from authority figures in the DC Universe because of his tendency towards embracing fame and glory at the apparent expense of personal integrity. Booster states that the events of the previous issue (Booster Gold #4) took place "last month." Therefore, this story takes place in November 1985. POWER UP: Booster demonstrates that his goggles have infrared capabilities, fighting in the darkened Metropolis Metroplex. 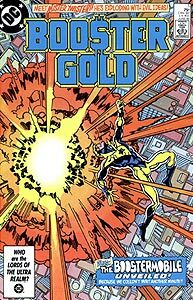 Booster appears to die in the skies above Metropolis, when a bomb that he has flown above the city to save its citizens explodes. This sequence is very similar to the future events of 52 Week 15, when Booster is apparently killed in another atomic explosion in the skies above Metropolis. Booster has survived the explosion. His costume is pristine, but his cape is damaged. Like the post-Crisis on Infinite Earths Superman, Booster's default force field protection only extends within a few inches of his body, allowing his cape to be damaged in the blast. Dirk boasts that Booster's annual income will soon surmount $2,000,000. Though not a staggering sum, it is more than enough to allow Booster to live a life of comfort. The mean American household income in the mid-1980s was approximately $30,000. HIS STORY: Skeets hints that both he and Booster are outsiders in time and that he has uncommon information about Superman's origins. This would seem to indicate that Booster or Skeets knows Superman's secret identity, one of the most closely guarded secrets in the DC Universe. Following a discussion about the appropriateness of Booster's enjoyment of 1960s music, Skeets reveals that Booster should appear as a 20-year old man in 1986, suggesting that people should believe that he was born in 1966. Booster also demonstrates that his costume is not a unitard, but a separate shirt and pants. HIS STORY: Booster admits that he has no Social Security Number or Birth Certificate. Could this mean that in the future there is no longer need for such documentation? FIRST APPEARANCE: First appearance of Booster's mother and sister (as pictures in a holographic globe). PRODUCT PLACEMENT: First appearance of the Boostermobile, a red Brysler-Booster Mark IV from Brysler Motors. The Booster mobile is a red sports car with blower, spoiler, open top, and a special recess and control panel for Skeets in the rear. The word "Booster" and a Gold Star appear on the side. On the next page, the Boostermobile is described as accelerating from 0 to 60 mph in 6.2 seconds and traveling a quarter mile in 12.3 seconds. Its top speed is about 135 MPH (217 KPH). FIRST APPEARANCE: First appearance of Jeremy Brysler of Brysler Motors. Brysler Motors is clearly based on American automobile manufacturer Chrysler Corporation which was founded in 1925 by Walter Percy Chrysler, Time Magazine Man of the Year in 1928. Jeremy Brysler bears more than a passing resemblance to Walter Chrysler. HIS STORY: Booster admits that he doesn't have a driver's license, a logical extension of having no citizenship documents or fingerprints on file. Do they still drive cars in the 25th century? Boosterrific Review: Marking time between the conclusion of the previous story arc and the introduction of the next, this issue is an unfortunate hodgepodge of elements. Mr. Twister is a completely forgettable terrorist who unfortunately holds the first half of this issue hostage in a story of routine super heroic adventure. (When the most interesting part of the story is the apparent death of the hero, you know something is wrong.) The rest of this book is a much more enjoyable investigation of the relationship between Booster Gold's supporting cast, Booster's mysterious origins, Booster's mysterious nemesis (Senator Ballard), and the introduction of the inimitable Boostermobile. In any other book featuring a flying hero, the inclusion of a personalized car would be considered a gimmick. In Booster Gold, it is an inevitable highlight. About average for a BG comic, but I always loved the Boostermobile, and I agree with Boosterrific, it's not a gimmick so much a comic highlight. Not a bad issue but a transitional one and while the run of the mill terrorist does little for the issue, the interplay between Booster and the cops helps redeem it.